I came. I saw. I slooowly conquered. From his pocket he whips out a red lollipop - one of the fancy ones you can only get at the Cracker Barrel. 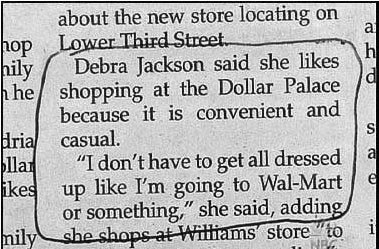 It is entirely possible that the above sentence made me think of the unfortunate interview in the picture below. That noted, I do think Cracker Barrel has some awesome candy. What's my point in all of this, you ask? Well, my point is, that I might have laughed a few times at the character antics in Racing Savannah. It was a fun, cute, and enjoyable love story. I won't act like there weren't a few moments sprinkled throughout which made me twitchy, but I'm able to overlook a little bit of awkward pining, repetitive questioning of self worth, an overdone focus on scents, and ridiculous snap judging when there was some character growth present. It was all kind of a balancing act. Sure, I kind of had a "trying to be relevant?" thought when Twilight and Harry Potter references showed up, but then one of the main characters had Star Wars sheets and I couldn't help but smile. So yeah...balancing act. We almost toppled over a few times, but I felt like there was enough positive to keep the stack from crashing. I never want to hear my dad say "doing the nasty" again. When stacking this book up against similar books in the genre, I think it came out ahead of the last several I've read. I wanted to smile. I wanted to see some horse racing. And I guess I got that! 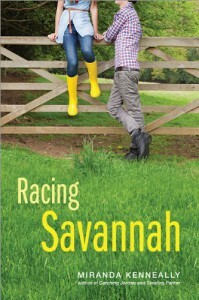 The strength of this story was mainly in the humor and the details around Savannah chasing her dream of racing horses. The characters themselves were not always three dimensional in my mind. I felt like they were popped out of "make your own YA character" molds and dropped into the story. Even if I didn't attach to the characters and wanted to tell Savannah to loosen up a good portion of the time, I'm glad I took a chance on the book. It might have taken me a week to read because I was busy, but I keep coming back when I had the chance. "In my heart, I'm an exotic dancer," Jack replies.